An industrial space in Maspeth, Queens that was once a glass and door factory was transformed into a mesmerizing temple complete with marigolds, meditation cushions, and a golden cosmic installation of a sun for a one of a kind stellar concert celebrating a newly released, and largely unheard body of work by pioneering musician and spiritual leader, Alice Coltrane. "Gospel, soul, funk, and chanting, all in one, it was amazing," said Johanna Gielbehous a Brooklyn-based filmmaker after listening to The Sai Anantham Singers sing Coltrane's exquisite devotional songs. Alice, the wife of the legendary jazz saxophonist John Coltrane, was a classically trained pianist, harpist, and a visionary musician considered to be among the greatest composers of the 20th century. Her cosmic jazz and spiritual compositions have been described as "prayers for humanity." For decades she's had a strong underground cult following among music collectors, DJ's from around the globe, and yogis. But the larger world does not know Ms. Coltrane's greatness and this despite the fact that she left an exquisite musical catalog and led a remarkable life -- she founded and was the spiritual leader of an ashram in California with hundreds of devotees. The six-hour musical extravaganza that converted the The Knockown Center into Coltrane’s mandir complete with an altar, blue rug, and eight hundred yellow cushions imported from India on Sunday evening was the closing night of the Red Bull Academy Music Festival. Saxophonist Ravi Coltrane, John and Alice’s son, followed the ashram singers with a powerful performance of his mother’s early jazz compositions in the sold out event. The ​concert celebrated the one-hour compilation entitled, “The Ecstatic Music of Alice Coltrane Turiyasangitananda," which was released earlier this month by David Byrne’s music label Luaka Bop. The album rocketed to number one on Billboard’s New Age and World music charts. Luaka Bop representatives said that the album would have topped jazz charts as well but Billboard did not accept the album under the category, an unfortunate decision they said since Alice Coltrane’s jazz influence is deeply rooted in her devotional music. These ten sacred songs were selected from four cassettes that Alice, also known by her Sanskrit name Turiya Sangitananda, quietly recorded between 1982 and 1995 and released through her company, Avatar Books, housed in Sai Anantam Ashram, the vedantic center she founded in 1983. It’s a body of work and a chapter in Coltrane’ musical life that is largely unknown outside yogi circles and spiritual music aficionados. The recent recognition of this masterful musician is long overdue. By all accounts Alice Coltrane was extraordinary. Born Alice McLeod, Coltrane's musical career began when she was a child in the churches of Detroit where she was born and raised. She was a musical prodigy schooled in old time spirituals, rhythm and blues, and classically trained on the piano. "There is a picture of mom when she was like seven on the piano," recalls Michelle. "Mom used to play at church and make a little money and she'd give it to grandma." "Sometimes it hits me how was she able to do so much, raise four children, be the spiritual leader to so many people, teach, compose, perfect her art-- it blows my mind when I think all that she was able to do," said Michelle. "There is a genius to her and certainly her music." The new compilation was engineered by jazz legend Baker Bigsby who worked with Ornette Coleman, Sun Ra, and John Coltrane and was the recording engineer on all of Alice’s devotional recordings. The compilation is luminous. You find Alice chanting, singing, playing her harp, and leading a choir of 24-celestial voices. There are eastern percussions, synthesizers, strings, and organs resulting in a delicious mélange of sacred and blissful music. "There is a genius to her and certainly her music." The music is an expression of Alice Turiyasangitananda ’s spiritual devotion in the last four decades of her life and contain the musical universe inside of this exceptional instrumentalist—from Igor Stravinsky to Bud Powell, from Detroit to India, from Africa to California, from Jesus to Rama, from old time spirituals and blues to ancient Sanskrit chanting. Words alone cannot behold the music’s transcendental beauty and healing power—her music is a spiritual experience. One reviewer wrote that, "listening to 'Om Shanti,' the first song in the compilation, is nothing less than an act of self-care." Yale Evelev, who co-owns Luaka Bop, was blown away when he heard Alice Turiyasangitananda's devotional music a year ago at the suggestion of DJ Prince Language. "Mine was a visceral musical response, Indian chanting, gospel,soulful this was music she invented, quite innovative, and very sophisticated," said Evelev. The response to the music, he says, has been astounding. "There was already appreciation for Alice's music but with this release we have seen something phenomenal." For many years however her musical work has been lost in her husband's giant shadow. "My mother was always happy to speak about John's music, it gave her pleasure; it's the way she was. Sometimes it takes time and I just think this is the right time politically and socially. After years of bootlegged digital versions, it's wonderful to see a beautifully packaged and tangible collection of her work." In the summer of 1963, when Alice was 25, she was part of a band led by vibrationist Terry Gibbs that opened for The John Coltrane Quartet at the famed New York City jazz temple, Birdland. It was there where she met John and two fell in love. They married in 1965, had three children. By 1967 John died of cancer leaving Alice a widow with four young children. Alice, who was on a spiritual quest with John exploring Eastern music and spirituality, delved deeper into religious studies after his passing. 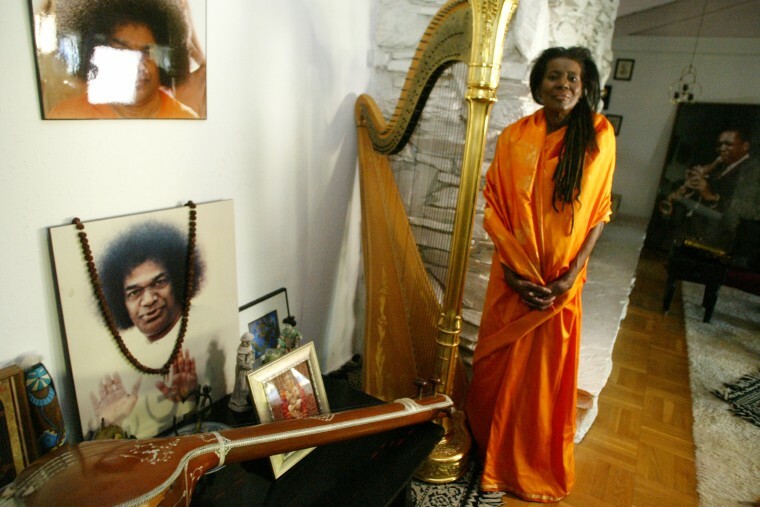 She returned from India with a desire to leave secular life, and moved to Los Angeles in the 1970’s devoting her life and music to spiritual realization. In 1975 she founded the Vedantic Center ​in ​her home in Woodland Hills. In 1983 with a growing flock, she bought nearly 50-acres of rolling hills in Agoura Hills, California, just outside of Los Angeles and opened her ashram​. Many congregated to join the celebration of Alice Coltrane. In 2017, no one would bat an eye since wellness, yoga, and meditation are ubiquitous. But in the 1970's, not so much. Alice was a black woman, a devoted yogi, a single mom of four, and a masterful musician. "Yes, my mother was way ahead of her time," noted Michelle. "She was a home-girl from Detroit who founded an ashram in the west. Meditation is now part of everyday talk, but back then, it was considered strange, and yoga was seen as just a bunch of people who laid on top of mats on the floor. But mom was always different." With a resurgence of work that uplifts and fuses musical influences from all over the world, it's almost as if the spiritual teacher who died in 2007 at the age of sixty-nine is reaching from beyond the cosmos to give the world a much needed hug. "Alice had a message of oneness, of inclusion, positivity, and respect for each other," says Evelev. "She left this music for us to enjoy, for our healing, and our growth," said her daughter Coltrane. A new fan, Giebelhous agreed: "The extraordinary music welcomed and soothed us to a spiritual celebration of beauty and joy."